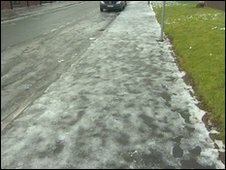 An 11-year-old girl has died after she apparently slipped on ice outside her primary school in Lancashire. Naeemah Achha suffered serious head injuries in the fall near St Michael with St John Primary School in Swallow Drive, Blackburn. She was taken to the Royal Manchester Children's Hospital after the incident on Thursday, but died on Friday. Head teacher Kay Cant described the year six pupil as an "intelligent, kind and popular girl". An investigation is under way into the circumstances of her death, and how she came to fall to the ground. A spokeswoman for Lancashire Police said Naeemah was believed to have slipped on ice, but that officers were still investigating. Blackburn with Darwen Council leader Michael Lee described her death as "a very shocking incident." He added: "Our sympathies go to the family, community and school." Mr Lee added that the council was giving its full support to the police investigation taking place to establish what happened. 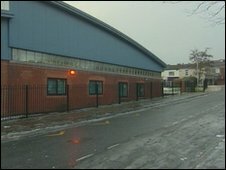 The North West Ambulance Service said paramedics were called to the school at 1100 GMT and found the schoolgirl conscious, but with head injuries. A support team from the council were brought in to support school staff and pupils, who were informed about Naeemah's death on Friday. "Naeemah was an intelligent, kind and popular girl who showed maturity beyond her years," said her head teacher. "She was conscientious, reliable and hard working. "Naeemah had a very good sense of humour, was always happy and had a smile that lit up the room. She will be sadly missed by everyone. "It is at times like this when the school and its wider community draw together to support each other. "Our thoughts and prayers are with Naeemah's family at this very sad time." Next week, pupils at the school are planning to put together happy memories about Naeemah to include in a book to give to her family.